This ultra comfortable layer is made from 88% Polyester/12% Spandex. The thumbholes are perfect to ensure that the sleeves stay in place while giving you some hand coverage too, without restricting movement. The zippered mock neck also keeps you feeling warm, cozy and protected from the elements. This layer is perfect to wear under larger jackets to give added warmth and protection or simply can be worn as the outer layer itself. 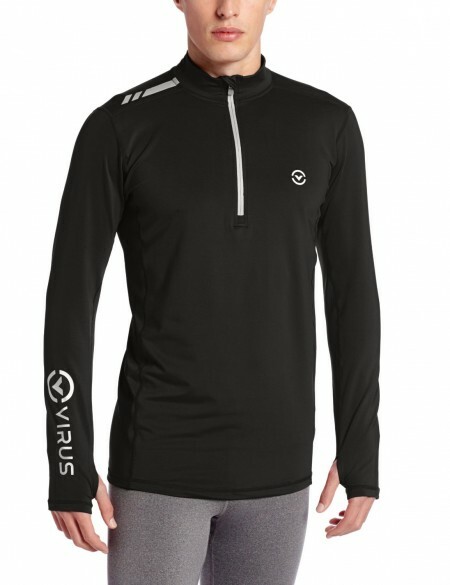 Perfect for the more active wearer the zipper down the front allows for added ventilation, and the responsive fabric regulates skin surface temperature keeping it up to 10 degrees F/ – perfect for runners and hikers who exercise in colder climates. The zipper is fully reflective as is the ink on all prints which makes for increased visibility and is perfect for those who undertake sports after dark. The Coffee Charcoal fabric is highly advanced, allowing wearers to remain warm, comfortable and dry whatever the weather. It is advised that if you are likely to experience extreme cold that the VIRUS Men’s Stay Warm 1/2 Zip Mock Neck jacket be bought in conjunction with a windproof outer layer. A tapered fit gives the wearer added comfort and protection, however, if you are intending to add layers underneath we recommend sizing up.